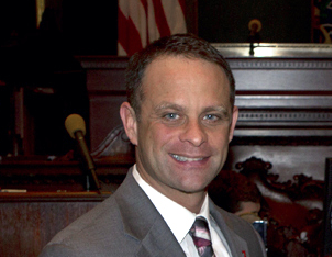 State Senator Sean Wiley checks in with the latest from Harrisburg. As a new member of the Pennsylvania Senate, I am quickly learning that there are certain traditions in Harrisburg, some more curious than others. As tradition would have it, in early February, Gov. Tom Corbett presented his 2013-2014 budget proposal to a joint session of the General Assembly. I've come out against several facets of this spending plan, noting that it is shortsighted, and that it holds our children's education funding hostage by tying it to ideas such as liquor privatization. In addition, the governor has decided it's not a good idea to expand Medicaid to allow hundreds of thousands of uninsured, working Pennsylvanians to receive health benefits. And then, there's transportation funding. The budget includes a $1.8 billion plan to repair this Commonwealth's more than 4,000 crumbling bridges, with only $550 million available in the first year. This is where one of those troublesome traditions previously mentioned comes into play. It seems that in Harrisburg, when it comes time to face a tough issue, the administration puts together a "blue-ribbon" panel of experts to examine that issue and recommend solutions. It then promptly ignores them. For example, in 2006, the legislature ordered a "costing-out" study to recommend adequate school funding levels. When the panel recommended much higher state support, that recommendation went into a drawer. In 2005, Gov. Ed Rendell formed a "Transportation Funding and Reform Commission," which reported its recommendations a year later. That, too, was ignored. Fast forward to today. Gov. Corbett is ignoring his Transportation Funding Advisory Commission's recommendation of transportation funding levels, which are nearly twice what he is proposing in this budget. This plan will not only inadequately fund our infrastructure needs, it will also create a future funding crisis in mass transit by eliminating nearly $500 million within 10 years. We, as a legislature, must work to fix this transportation funding plan. Even Senate Republicans are talking about the need for much higher funding levels for transportation. Sen. John Rafferty, the Republican chair of the Senate Transportation committee said he would like to see a final transportation funding plan that totals at least $2.7 billion in new annual revenues. I understand it may never be the right time to bite the bullet and invest in our infrastructure, but that's what we must do. The time to invest is now in order to see long-term benefits such as job creation and sustainable growth. We have our own structurally deficient bridges in Erie County. We have the Port of Erie, which, with enhancements such as the Inland Port Project, will bring long-term benefits to our community. Let's move this Commonwealth forward with new traditions. When the experts make recommendations, let's consider them, not simply turn our backs on their advice. Would you like to learn more about the Transportation Funding Advisory Commission's report? Visit www.tfac.pa.gov. You can email the members at TFAC@pa.gov. As always, if you have questions, comments or concerns regarding any issues, please do not hesitate to contact me at 453.2515 or at senatorwiley@pasenate.com.